I miss having Cone ice-creams.Not the waffle cone and definitely not the Cornetto ones but the simple cone ice cream with even simple(but delicious)ice-creams.There was a place in Adyar where we went specifically to buy the plain cone filled with rich,delicious chocolate ice-cream.I'd be lying if I say I wasn't devastated when once I ordered,the owner gave me a Kwality brochure to choose from since they stopped the cone ice-cream altogether for lack of customers. Same case with bakeries.Gone are the days when you could choose between simple butter cakes,cupcakes and jam tarts.Now even a local bakery stocks Rosette swirled cupcakes and Fondant covered cakes.Not that I don't like either,but I feel the old world charm has lost.As kids,we used to be spoilt for choice in the Best bakery near our home even when they stocked less than 10 items in all! 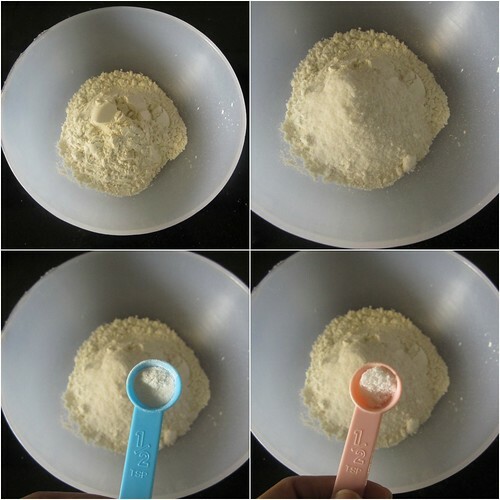 Sift/stir together flour,powdered sugar,baking powder and salt. 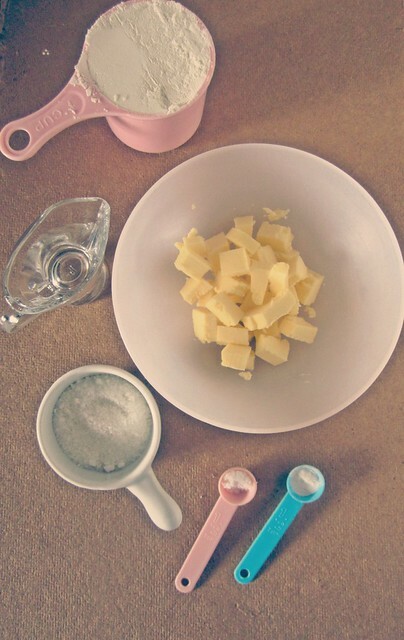 Rub in the butter with your fingertips till the mix resembles breadcrumbs. Add ice water gradually and form a soft dough.Wrap with cling film and refrigerate for 25 minutes. 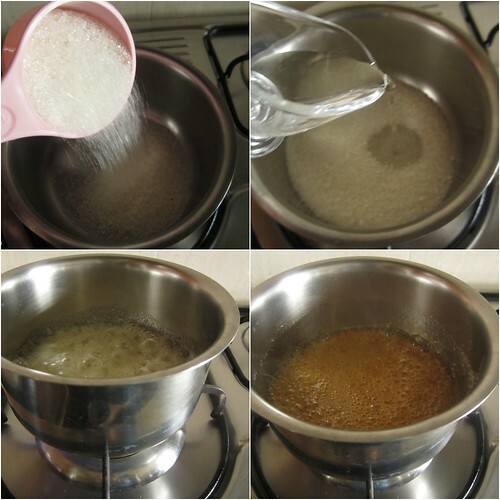 Mean while start with the filling.In a thick bottomed sauce pan add sugar and water and let it come to a boil.Let the sugar caramelize and turn a dark shade of brown. Remove the pan from fire and add the butter and cream.Stir well and bring it back to fire.Cook on a low flame for 4-5 minutes,do not let it boil.Switch off the flame and let it cool completely. Mix in the chopped nuts and keep aside. Preheat the oven to 175C.Grease the tart molds with butter. Take the dough from the fridge and divide into equal sized balls.Roll each ball and place into the tart mold.Prick the base all over with a fork. 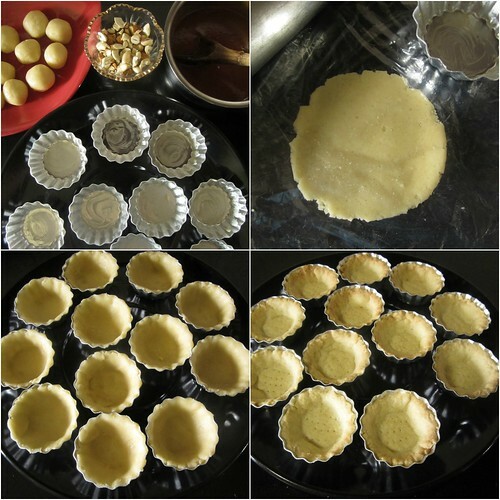 Bake for 15-20 minutes or till it is slightly brown around the edges of the tart. 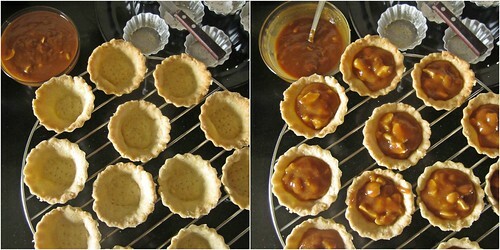 Remove from the oven and let it cool completely.Remove the tart from the tins. 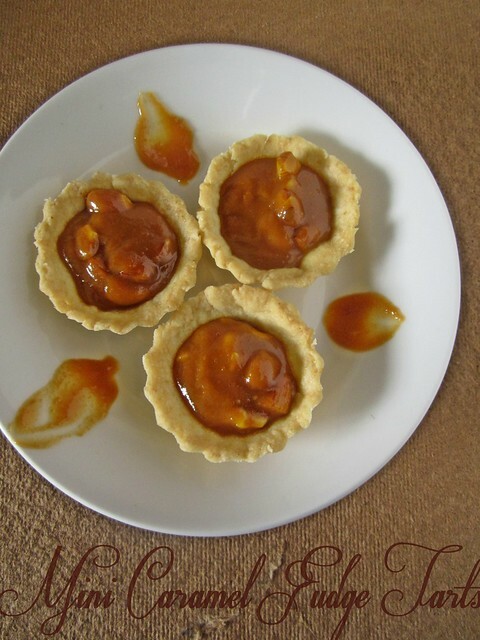 Fill the cooled tarts with the caramel fudge filling. 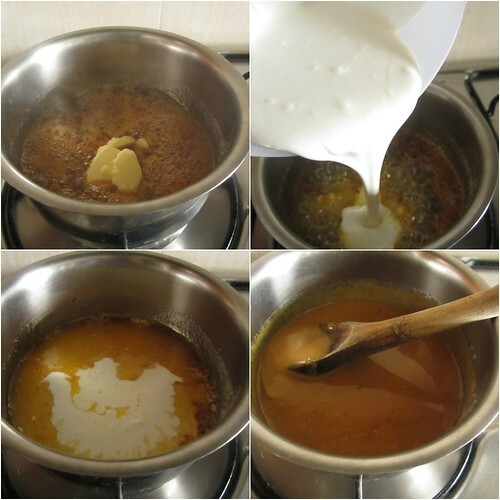 While making caramel,make sure you keep a close watch on it as it can go from caramel to burnt within a matter of seconds. I added Cashewnuts and Almonds while Maria has added Raisins too,go ahead and add any dry fruits of your choice! 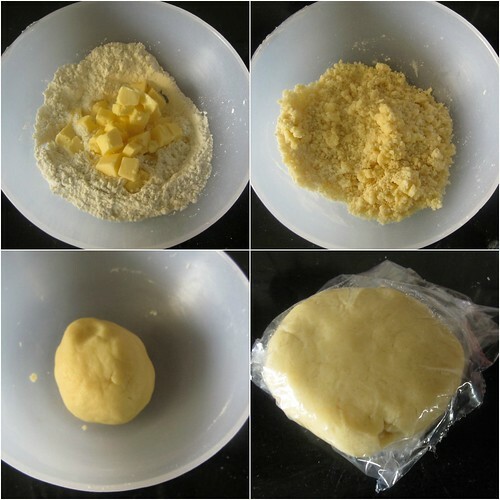 Do not overwork the dough for tarts.Knead lightly with your fingertips and stop when the dough has come together.Roll the tart dough in between a cling wrap to avoid adding more flour. 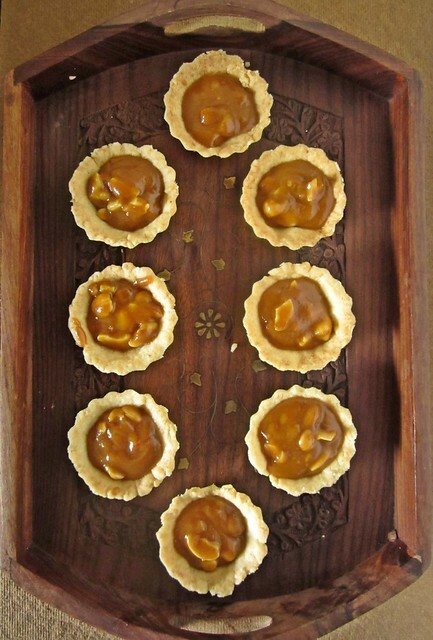 OH, wow, cant imagine a tart filled with goodness of caramels and nuts, looks just awesome.Very nice clicks too. Love them one of my favourite and i make them often here too, first time i ate them i was addicted to it and it was when Hans and I were dating and we ( he) used to take me for lunch /dinner in pandal in ernakulum very often and they had these in their pastry section, These looks so good too. 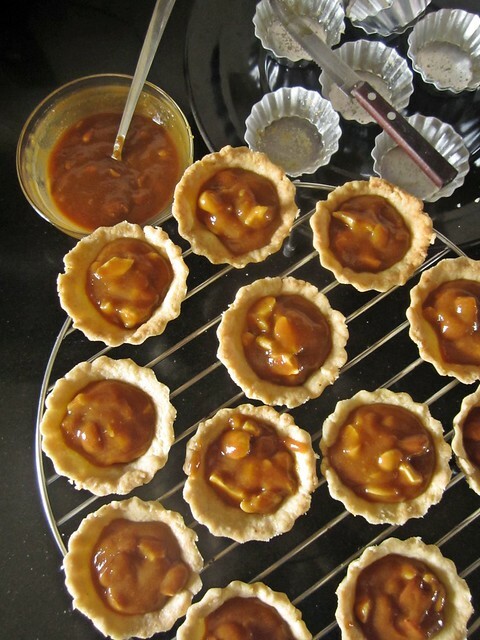 very very neatly explained, Divya...lovely tarts ! They look so yummy !! The idea of adding Caramel is so unique in its own sense, never thought abuot it really. But then we dont make Tarts from Scratch very often anyway ..
i agree the old world charm has been lost. gone are the days when buying & eating a simple muffin or cookie or pudding was so much fun. i would frequent the parsi bakeries in mumbai which are dying a slow death with only a few in existence now. loved these fudge tarts.